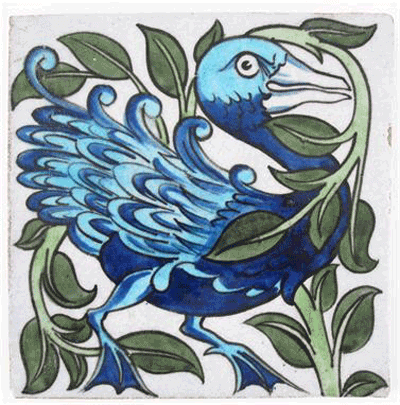 William De Morgan was one of the most prominent ceramic artists in the world and a leader in the Arts and Crafts Movement. Born in 1839 to a French family of renowned intellectuals, his father was a mathematics professor, and his mother was active in the early 19th-century suffragette movement. In 1859 De Morgan attended the Royal Academy School, where his classmates included Frederick Walker, Simeon Solomon and Henry Holiday. It was through Holiday that De Morgan would meet his lifelong friend and business partner William Morris, who would ultimately greatly influence his works and life. In 1863 De Morgan began to shift his attention to decorative arts. He designed tiles, stained glass and furniture for Morris. & Co. until 1872. Along with painter Edward Burne-Jones, De Morgan and Morris had a prosperous business relationship that spanned for many years. In 1872 a fire in his studio led him to create his own a pottery space and firm in Chelsea. His innovative spirit and sensibilities led him to examine every technical facet of his art. Curious and inventive by nature, he was consumed in analysing the chemistry of glazes, firing techniques, and how to transfer patterns. However, De Morgan generally did not throw or paint the pots, rather he decorated them. His patterns could be identified by their depiction of galleons and fish, which were a favourite motif of his, as were outlandish birds and other animals. Many of De Morgan’s tile designs were created with the intention that lain together, would create a complex and elaborate pattern. It was also during this time that De Morgan brought back the lustreware technique. Lustreware was a considered a dangerous technique in which a thin metal film is coated on the surface, creating an iridescent effect whose colours would glimmer depending on how light was reflecting on it. De Morgan was responsible for reviving this technique which originated in the Middle East, as well as advancing it. It was around the year 1875 that De Morgan began to create what he referred to as Persian colours, which were inspired by 16th-century Turkish pottery in Iznik. Filled with lush shades of blues, reds yellows, greens and purples, De Morgan applied to these works his signature abstract and floral designs. Throughout his life, he remained influenced by this Turkish artistry. In 1882, De Morgan’s business was growing, and his pieces were in demand. Moving into a larger space, he began to increase production of vases, bowls and dishes. His magnificent animals and intricate floral motifs would continue to be significant subjects in his works, thanks to the influence of his friend William Morris. However, it wouldn’t be until 1888 that De Morgan would leave his lasting mark upon the world. Beginning a ten-year business relationship with architect Halsey Ricardo, during this period De Morgan would create some of his most astounding and unforgettable works. Infused with a rich aesthetic and more sophisticated designs, he created the masterpiece “Sunset and Moonlight Suite”, triple-lustred dishes made of gold, silver and copper. Upon moving to Italy due to health issues, De Morgan had all but abandoned his pottery business with Ricardo, and it closed in 1907. De Morgan still found success as an artist, however this time as an author. His debut novel “Joseph Vance” would become an international sensation, and he followed with several more best sellers. 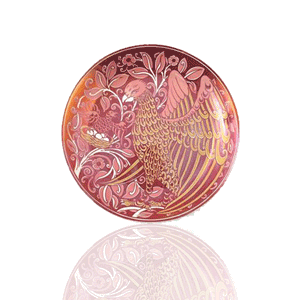 De Morgan will forever be recognised for his imaginative artistry and well as his technical advancements in pottery. His contributions include new decorative techniques and he refined kilns as well as other equipment. His works can be found in the Victoria and Albert Museum, The De Morgan Centre and other exhibits. If you would like a free, no obligation valuation of your William De Morgan please use the form below. 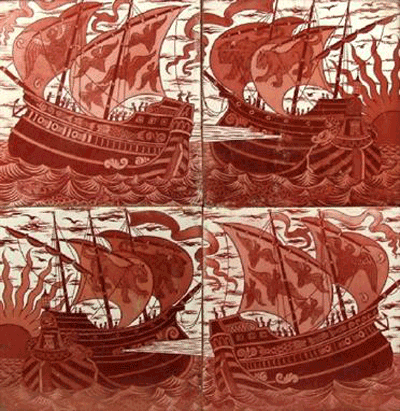 You can also email details about your William De Morgan to [email protected] or call us on 01270 440357.